Sandal season is finally upon us, so it’s time to ditch the heavy socks and boots and let your toes see the light. But exactly what sandal styles should we be getting our feet into this season? Just one scroll of our feeds will show one particular sandal trend dominating right now—and you’ll be glad to hear they’re shoes you’ll actually be able to walk in this summer without getting blisters. Sporty sandals are having a major moment right now, and it’s easy to see why: They’re unexpectedly cool, ridiculously comfortable, and have a lot of personality. And no one does sporty sandals quite like the pioneers of the performance shoe—Teva. 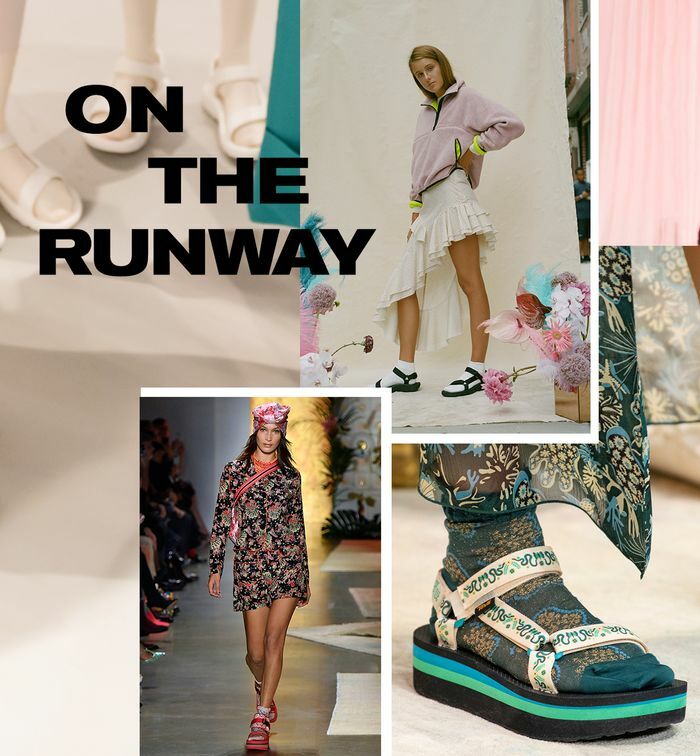 They made a welcome appearance on the spring 2019 runways, from Bella Hadid sporting them at Anna Sui to appearances at Sandy Liang, Colina Strada, and PH5 to name a few. I was lucky enough to give Teva's latest GC100 collection a whirl on a recent trip with the brand to the original birthplace of the sporty sandal, the Grand Canyon. Here’s a little fun backstory: The sporty sandal was originally created out of necessity back in 1984 when a resourceful river guide on the shores of the Grand Canyon strapped two velcro watch bands to a pair of old flip-flops to prevent them running downstream—and just like that—Teva was born! Teva's GC100 collection is a partnership with Grand Canyon to celebrate its 100th year as a national park—paying homage to the brand’s birthplace in a campaign it’s aptly named “Born in the Canyon.” The brand has donated $100,000 to the national park and has partnered with the Grand Canyon Conservancy’s Field School to provide scholarships for underserved youth and accelerate Teva’s commitment to the preservation of our outdoor treasures, as explained to me by Anders Bergstrom, general manager at Teva. The collection mixes functional features with cool canyon-inspired embroidered detailing for an innovative twist on the sporty sandal. They look chic with jeans and dresses alike, and they may just inspire you to venture a few more steps into the great outdoors this season. Scroll below to see how fashion girls are wearing their Tevas and shop the Grand Canyon collection as well as other sporty styles to nail the trend this season. The intricate design and chic color palette of the straps add a fun touch to any spring outfit. Taking flip flops to the next sartorial level. The cool straps exude a retro feel, plus the rugged sole is ready for every activity on your summer list. Take these to your next pool party. The flatform on every fashion girl's wish list. The perfect addition to the trending spring beige trend. These also come in chic white. We love the cool fringe detailing—perfect for festival season. Bella Hadid wore this silhouette on the spring runway. Add to cart! These may be your most versatile sandals of the season. This press trip was paid for by Teva. Editor's opinions are her own.